China’s lunar sample program involves upcoming re-entry capsule test to evaluate high-speed plunge into Earth’s atmosphere. China is preparing to launch a mission next week that will help pave the way for an ambitious lunar sample-return effort. The upcoming launch of China's next mission is expected to take place Oct. 23 from China's Xichang Satellite Launch Center, and will apparently send an experimental, recoverable probe to lunar orbit and back. The goal is to validate re-entry technology for Chang'e 5, a future robotic mission that will land on the moon, collect samples and return those specimens to Earth. Chang'e 4 will be adapted to verify technologies needed for Chang'e 5, the third step in China's methodical moon-landing program, according to Chinese news agencies. Long March booster being readied to support China's next mooncraft takeoff this month, dedicated to testing technology for future lunar sample-return mission. The challenging Chang'e 5 mission, set to launch around 2018, will require technological breakthroughs in numerous areas, such as moon landing and takeoff, sample collection and encapsulation, lunar-orbit rendezvous and docking and high-speed Earth re-entry, Chinese officials have said. "We have begun to study how the Chang'e 5 will blast off from the moon and dock with the in-orbit re-entry capsule," said Wang Pengji, a space expert at the China Academy of Space Technology. 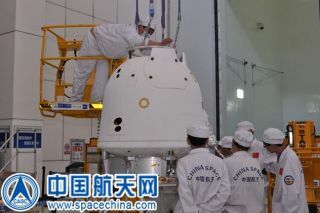 China’s newest moon probe arrived in August at the Xichang launch site, according to a statement from the administration. The 4M mission is dedicated to Manfred Fuchs who died early this year. 4M stands for the Manfred Memorial Moon Mission. The state-run Xinhua news agency has reported that the plan is for the spacecraft to be launched to lunar orbit, then return to Earth at a blistering speed of more than 25,000 mph (40,230 km/h). It will parachute onto terra firma to complete its journey. Technical management of the 4M mission is led by LuxSpace of Luxembourg, an affiliate of OHB AG. LuxSpace chiefly develops microsatellites and actively participates in the OHB System-led Small GEO initiative. The 31-pound (14 kilograms) 4M probe is designed to fly by the moon and then return Earthward. LuxSpace launch preparation team in China has successfully completed the system functional tests and health checks of its 4M probe before integration with China's Long March 3C. Tucked inside the small spacecraft are several scientific instruments, including a radio beacon that permits the sending of messages while testing a new approach to locate the spacecraft. LuxSpace is encouraging radio amateurs around the globe to receive the transmissions and send in data. An additional instrument will measure radiation levels throughout the satellite's trajectory around the moon, using a special chip provided by Spanish company iC-Málaga. The 4M lunar flyby amateur radio payload was shipped to the Xichang Satellite Launch Center on Oct. 2. Editor's Note for Oct. 16: While there is little official China word on this mission, there are some reports that the next lunar flight by China is dubbed Chang'e 5 T1 or precursor mission, and not Chang'e 4. Also there are new reports that tag the mission as a circumlunar free return trajectory back to Earth for landing on Oct. 31/Nov. 1. Leonard David has been reporting on the space industry for more than five decades. He is former director of research for the National Commission on Space and is co-author of Buzz Aldrin's 2013 book "Mission to Mars – My Vision for Space Exploration" published by National Geographic.Follow us @Spacedotcom, Facebook or Google+. Originally published on Space.com.